Running in at the moment but we slipped out on the Trade In to try line class shark fishing again. The wind was NW at 15 knots all day which made for a good drift. The water was green and 64 degrees throughout the day. We started on some structure just inshore of the 28 mile wreck and then moved out to the 28 mile wreck for a drift with no success. 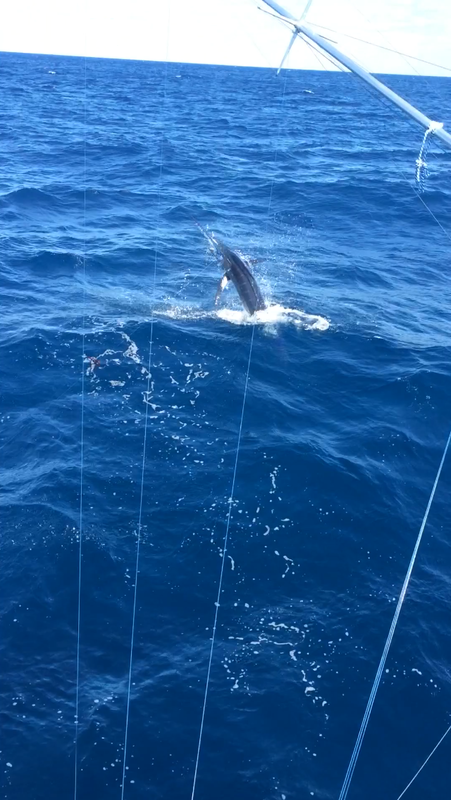 Then we pushed off to the NE tip of the Cigar and ended up with one encounter from a small Mako. Not what we had in mind, but a friend of mine did get into a thresher shark and released two small makos, so there are a few around. Back at it tomorrow. Well, our weather here in the Mid Atlantic over the past 7 weeks has been repetitive, Wind, Wind Wind. So getting out fishing has been a challenge and we have been pushing our weather windows hoping they will stay open long enough for us to fish. Today we finally had a shot, so we slipped out on the 27′ Contender “Trade In” for a wreck fishing trip in search of sea bass. Black Sea Bass season just opened up this past Saturday so we wanted to see what we could find since the ground swell from the hurricane had subsided. We went to a wreck on the 20 line and got on them quick. Seas were calm and the water was 65 degrees. We were getting double header sea bass on every drop for about a half hour, mostly throwbacks, but action was great. There were even some small bluefish mixed in as well. Then the wind came up and came on strong. We set the anchor to try and stay over the structure where the fish were but with the current opposing the wind we were swaying all over the wreck and we could not get anymore bites. We reset the anchor 4 times, but enough was enough and we packed it up and ran in before it got too rough. Did another line class sharking trip on the Trade In today. We stayed inshore around the area of the Misty Blue wreck and the lumps around it. Overall it was lifeless. Water was green and 67.5 degrees all day. It was choppier then expected with seas at 3-6 feet out of the SE and the winds came up a little more then expected, but we still got the day in. Unfortunately no action for our efforts. We slipped out on the 54 Ocean Yacht, Fin Addict today in search of wahoo along the 30 fathom line. There were a few caught around the Indian Arrow in the finger of blended blue 69 degree water there and it was still there today. The NE 20 knot wind and 4-6 foot chop made it a little tough and the two weedlines were broken up making it tough to fish the weedlines. 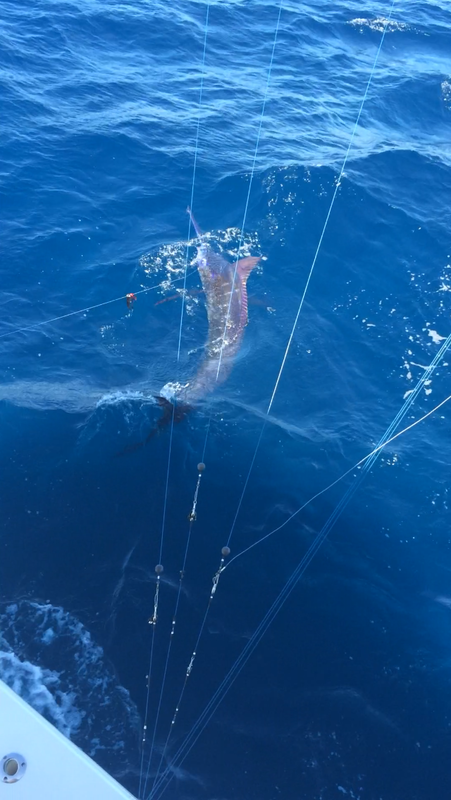 We picked at some dolphin here and there throughout the day, but we kept searching for a wahoo. Unfortunately we never got the bite we were looking for, but still came home with dinner. Back at line class shark fishing tomorrow on the trade in. We made the run offshore on the Trade In again today. We started in between the Spencer and Wilmington in blended blue 72 degree water but lifeless. We trolled upsea down into the Wilmington Canyon where there were a few bigeye bites in the morning but not much to it. 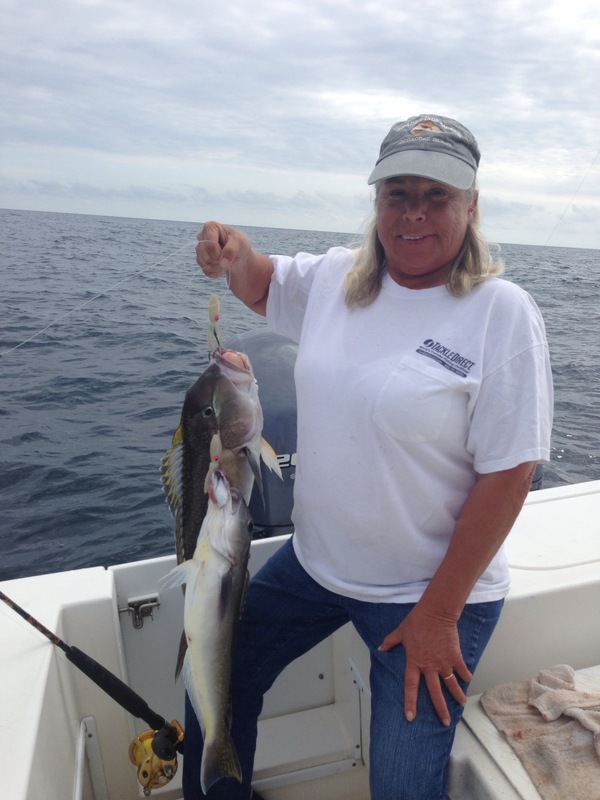 We spent most of the day deep dropping for tilefish and caught plenty of em. We heard reports of weedlines and wahoo in 30-40 fathoms just NE of the elephants trunk so we ran in to check it out. 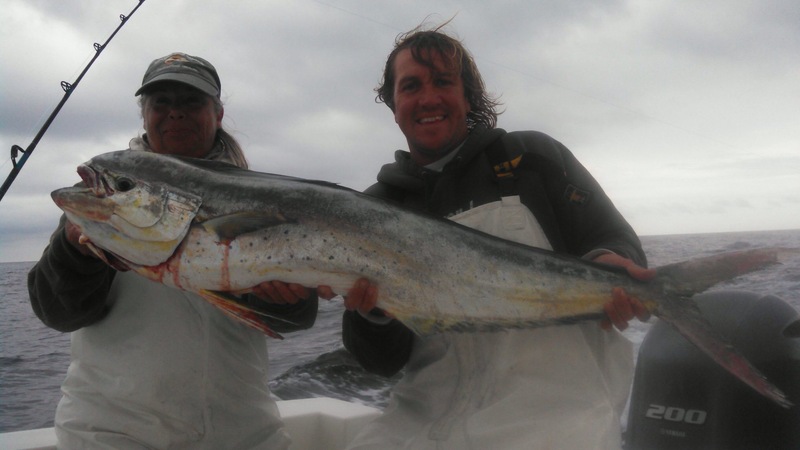 We ended up getting a nice gaffer dolphin but ran out of time and headed home. With the full moon last night, the water temps dropping, and reports that the false albacore have moved through the inshore lunps, we decided to give shark fishing a try. We had a NW wind at 15 knots all day and fished the trench near the 28 mile wreck, the 28 mile wreck, and the bass barn reef with only one encounter that we could not identify. The water was green and 68 degrees which is a little warmer then I was expecting. We may have been a little too early.